Only Parent Chronicles: Another Great Giveaway - $50 CSN Gift Code! Another Great Giveaway - $50 CSN Gift Code! As one of the hosts of Friends You Love, I have been very fortunate to be able to provide a number of opportunities for readers to win some super cool prizes. Today is no exception. Thanks to my friends at CSN Stores, I am offering the chance to win a $50 gift code to any of the 200+ CSN store vendors! To be eligible, you must live in the U.S. or Canada. To enter, visit CSN Stores and leave me a comment telling me how you'd like to spend your $50. Please make sure to leave a separate comment for each entry! Contest will end at 9:59 pm CST on Saturday, September 25, 2010. If you don't have an email address attached to your profile, please be sure to include it in your comment, or I will have to pick someone else. Winner will be selected via random.org and notified via email! Lots o' love and good luck! I'm following your Blog Frog!! "What not to do at a wedding"
I'm a Liker and a Follower of you BABY! I would buy a sewing machine! i would buy a pair of shoes. love the fergies! I'd like to buy some U*Neaks socks and shoes for my youngest. I would get a new colander for the kitchen - in pink! I would buy an Emerilware cast iron 6 qt dutch oven. They have fiesta(ware) so this will be easy for me. I'll go with a mix and match canister set. Following that_one_mom on twitter as ky2here1. Following CSNStores on twitter as ky2here1. I'd get the Black & Decker 12 Cup Programmable Coffeemaker. I would make a purchase for the garden- Echo Valley 10" Illuminarie Globe. I would put it towards a Beaba BabyCook! My sister told me about it and now I really want one! I would buy the awesome Talicor Family Games Escapades Board Game! I would get a Boss Office Products Adjustable Deluxe Fabric Posture Chair. I would love to buy my daughter the DuneCraft Healing Garden Kit. i would buy a watch box for my hubby. thy have a nice slection. I'd love to get a Kit-Cat Clock. I've wanted one since I can remember. I would get the Emerilware Hard-Anodized 8" & 12" Nonstick Frying Pan Twin Pack. Joined the OPC Blog Frog Community! I follow CSN Stores on twitter (@whitechocolatec). 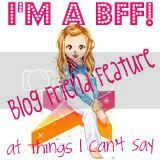 I'm a Friends You Love blog follower via GFC. I would love the Big shrimpy original dog bed! I would buy a hydration pack for hiking. I like the Kitchenaid stand mixer. I would get my new little grandson a John Deere Bookshelf for his bedroom. I'd like to get a pasta maker. Can't go wrong with carbs! Following Friends You Love on GFC. I would spend it on one of the cat trees. I joined on Blog Frog. 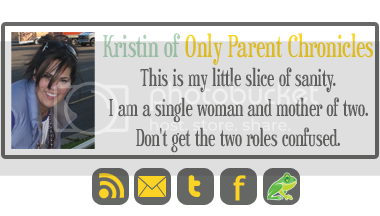 Liked Only Parent Chronicles on FB. I would like to buy the Cuisinart Pasta Maker Stand Mixer Attachment from CSN. I would buy my dog a new bed- she needs one! I would spend it on christmas gifts for my son, he would love the little tikes cozy coupe. I would like a new slow cooker and the Hamilton Beach Stay or Go Slow Cooker looks like it would make a great replacement one. I'd love to put it toward the Coakley suede tote bag. I'd like to get two cutting boards (Totally Bamboo Hawaiian Kauai Cutting Board - 20-1200) - one for myself and one to give as a gift. I follow Only Parent Chronicles via Google Friend Connect. I would get the Voit 32" Table Top Foosball Game - 66500 for my son's birthday. I Like Only Parent Chronicles on Facebook. I would like to get the Badger Basket Natural Moses Basket with Sage Gingham Bedding. I would like to buy a Baggallini handbag. I would get the Gotham Table Lamp for my bedroom. I would get the Traveler's Choice Amsterdam 2 Piece Carry-On Luggage Set in Burgundy - TS6902R. I would be the proud owner of a Kalorik coffeemaker. I would put it towards a Cuisinart Food Processor!